Himalayan salt is a natural mineral salt rock that is renowned to have health benefits as well as creating a relaxing, calming ambiance when used as a lamp where ever they are placed . Firstly the rock salt is cut out from the foothills of Himalayan Mountains and craftsmen hand carve many shapes , before they make their way into many people’s homes. USB Salt Lamps do not have the same healing benefits as other (electrical) Salt Lamps. USB Lamps have a LED light bulb in them, LED does not produce heat; it is the heat from a Light Bulb which heats the salt which then produces negative ions to purify the air. So, USB lamps are more for decorative and metaphysical purposes only. Computers and wireless devices create unhealthy electromagnetic fields (Emfs). Keeping a USB Salt lamp next to your computer helps counter EMF (electromagnetic radiation) organically, because these ancient crystals resonate at a frequency nearly identical to our bodies’. Easy on the eyes as it shines serenely, our Computer Companion is also easy to travel with and ideally sized for a small office or dorm. Where We Place USB Salt Lamps? 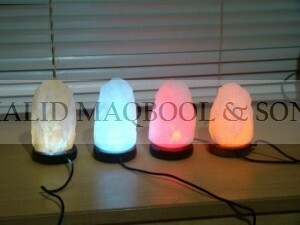 The soothing glow and striking shapes of our USB Salt Lamps will enhance the decor of any room. These natural works of art not only look stunning but are known for their enormous benefits to our well-being. A Child’s bedroom: Place a comforting USB salt lamp by your child’s bedside. It is a completely safe and lovely night light, and will enhance your child’s sound sleep, keeping the atmosphere clean and healthy. At your workplace: USB salt lamp at work can help improve your concentration and refresh you, minimizing the effects of fatigue, stress, artificial lights, artificial air environment, and radiation from office equipment particularly your computer monitor. USB Salt Lamps are the perfect gift for anyone who works at a desk job! The device is visually intriguing, completely silent, and gives off no smells or fragrance. It is completely safe to use and draws a very small amount of power from your computer to power the high-efficiency LED lights. The lights are built into the base of the lamp and never need replacing. 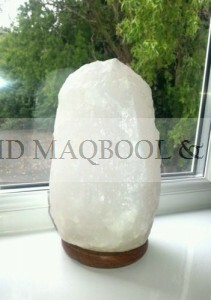 The approximate weight of the USB salt lamp is 1.75 lbs (with an average height of 5.5″ and base width of 3.25″). As each lamp is unique, the actual weight varies slightly from lamp to lamp. Our USB salt lamps are beautifully hand-shaped from real salt crystals formed millions of years ago when the Earth was pristine. As a result, they are completely free from modern-day pollutants such as pesticides, DDT or PCB. USB Salt lamps come from deep inside Himalayan salt caves, where huge seams of trace-mineral-rich salt are harvested and transformed into edible salt, salt lamps, salt tea lights and other items. The salt is considered “better than organic” because they are wild crafted from inside a mountain, completely free of modern-day chemicals. This salt contains 82+ trace elements, including magnesium, zinc, selenium and more. It is a “full-spectrum” sea salt that’s slightly pinkish in color. The taste is widely considered to have more depth and richness compared to processed white table salt.